The time has come for another Hearthstone expansion and the usual four month cadence lives on. This one is a 135-card joint called "Rise of the Shadows," which focuses on the ethereal and evil Rafaam, as well as his "League of E.V.I.L. with a typically lore-bending yet comical theme. Coming off of the troll-centric Rastakhan's Rumble back in December this set is a bit more inclusive race-wise, as it features villains from all walks of life, including goblins, orcs, the aforementioned trolls and ethereals and even kobolds. 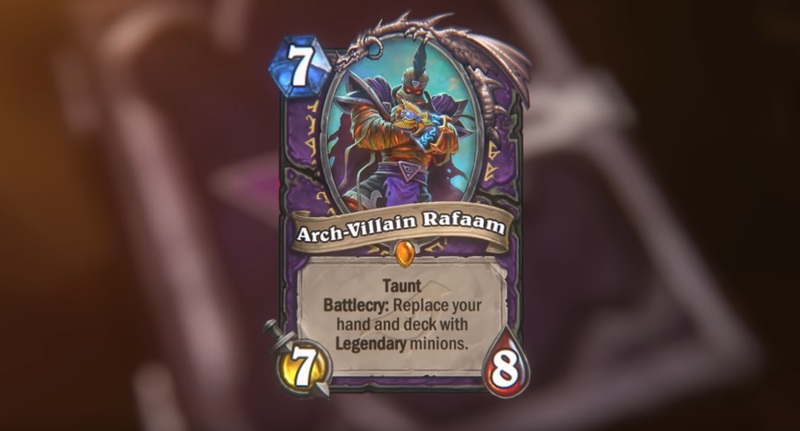 Headlined by Rafaam himself (who replaces your hand and deck with legendary minions as his battlecry) the expansion will focus on "lackeys," which are juiced up 1-cost 1/1 creatures, as well as "schemes" (spells that upgrade as you keep them in your hand) and twinspells (cast them to create a copy in your hand). It also brings back concepts introduced in expansions that are now dormant (wild). As someone who's played every expansion it doesn't particularly excite me (there were similar themes in the Gadgetzan and Boomsday Project sets), but it looks neat enough.